Giovanni Trapattoni praised Robbie Brady for his impressive Republic of Ireland debut as the Manchester United youngster starred in Tuesday's 4-1 friendly win over Oman. Brady has not yet played for United's first team but hit a goal and set up two others in the Craven Cottage win. "I think Brady played well in the first half," said Trapattoni, who withdrew the winger after an hour. "He scored a goal also and I think he can also do better." Trapattoni added:"He might be called up into the squad for the next match but he would not necessarily be in the team (if he isn't playing regularly). "This is a problem we have in our team, that five or six players only usually play 30 minutes or so every week." The Republic put in one of the worst performances of Trapattoni's reign on Friday night as they scraped a 2-1 win in Kazakhstan thanks to last-gasp goals from Robbie Keane and Kevin Doyle. Trapattoni made 10 changes for the game in London and the result was a much more fluent performance with Doyle, Shane Long, Seamus Coleman and Brady all impressing - admittedly against a weak Oman outfit. 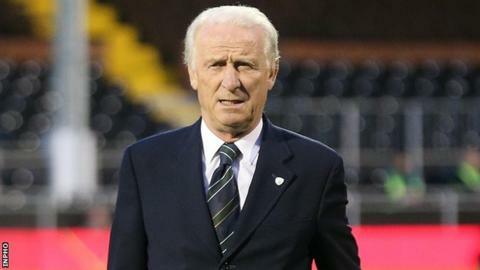 "The victory is important for us," Trapattoni added. "We made a lot of changes but we played technically well. Brady was good, David Meyler played well and James McCarthy impressed me with his personality and so did Seamus Coleman." James McClean was lively when he came off the bench just four days after launching a Twitter outburst after being left on the bench in Astana. The Sunderland winger went close with two shots in Tuesday's game but looks likely to have to settle for another bench role in the next World Cup qualifier against Germany on 12 October. "Probably no," Trapattoni replied when asked if McClean would start against the Germans in Dublin. "Because I think about Aiden McGeady and others. Every manager must think about the strength of the opponents. "I am not angry with him (about the Tweet). I never get angry with my players and I don't watch Twitter."